One of the best comics you might hear enough about is Archie Comics' 'Afterlife with Archie.' It's a horror-themed alternate universe where Riverdale has been overrun by zombies leaving Archie, Betty, Reggie, Kevin and others trying to survive. After a long break, the series is back on track with issue nine. With writer Roberto Aguirre-Sacasa taking on so many duties, Chief Creative Officer for the publisher, writer/producer of shows like 'Supergirl' and 'Looking' and fully involved in bringing the live-action adaptation of 'Riverdale' to the CW this Fall as executive producer. So, naturally 'Afterlife' had to take a momentary backseat while Aguirre-Sacasa was conquering television. It doesn't take long to fall back under his spell when the story pivots to Reggie Mantle. Told from Reggie's perspective, it's a revealing and candid first-person account of how he sees himself and how he feels about others in Riverdale. The usually selfish and boastful Reggie is given more layers in this confessional narrative revealing why he acts the way he does and nervously tries to fail an online sociopath test.There's more to Reggie that anyone knew and he blames himself for the zombie apocalypse. Just when he think he's found humility and nobility a giant twist changes everything. Francesco Francavilla does a wonderful job of pacing the issue, especially in the final scenes with Reggie amid a herd of zombies. But throughout, the layouts are efficient and fluid moving from Reggie's perspective to that of Midge or Kevin. As always, Francavilla's use of shadows and facial expressions make a distinct impact and the different color schemes distinguish the present day from the flashbacks. Most powerful is how Francavilla conveys Reggie's pathos with the only the look on his face. He actually draws compassion and empathy from the traditionally obnoxious character. Hopefully, Aguirre-Sacasa has submitted enough scripts to keep this terrific series going for months. It's worthy of being on everyone's pull list especially as Reggie comes to a crossroads that could change everything. The way Sabrina is used here is both shocking and frightening. 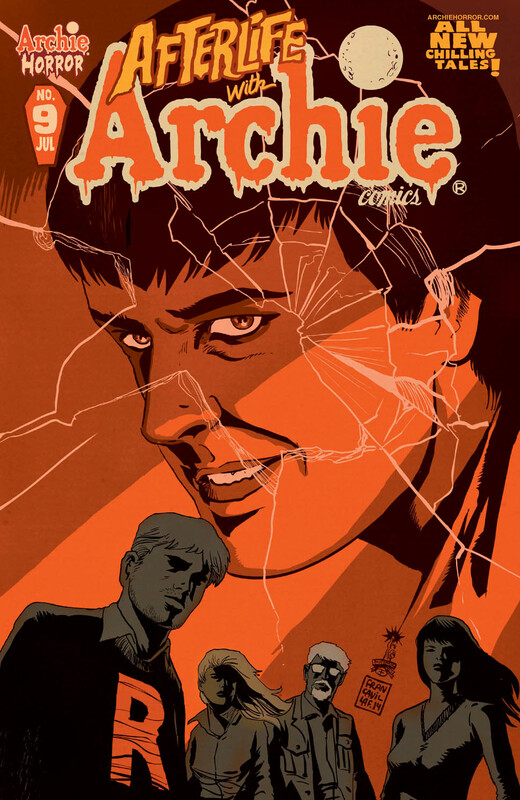 'Afterlife with Archie' is back and as creepy as ever.